When it is freezing cold outside and you decide to go outside to enjoy that chilly moment. What would you do? Definitely, you think of wearing layers & layers of clothes to deal with the crisp. If you’re in a hurry, here are our two favorite down jackets for women in this review. Well, the idea is okay when you are at your home. But, while you are out on a hike or a trek, it would not be possible carry unnecessary loads. So, why not think of an alternative to escape the needless burden? The best idea is purchasing a good Down Jacket. The down jacket will make you warm and insulated. And they barely weigh less than a pound. A down jacket is a jacket insulated with soft and warm under feathers from duck and geese. They are the exotic insulator with lofty fluffiness and tiny air pockets for trapping warm air & retaining heat. Hence, if you are outgoing to an icy weather, compulsory carry a down jacket. You can seriously get cold and frozen in case you don’t. This is the concerning topic I have brought for all those enthusiastic lady travelers, the finest Down Jackets for women. Ladies! Keep calm till I unfold the 10 Best Down for Women helpful for every chilly outing, you would be heading. Why Are Down Jackets Important For Hiking? How to Choose Down Jackets For Hiking? •	Hydrophobic 750-Fill-Power European Nikwax Goose Down. Winner of Editors’ Choice Award in the Women’s Down Jackets section, Mountain Hardwear Hooded Ghost Whisperer are one of the best down jackets for women. They are incredibly light, compact and warm for its size and weight. Weighing just 7.2 ounces, they get easily packed into its own pocket. The down jacket has the softest hand fabric of all. They are world’s lightest full-featured down jacket. The ultra-fine fabric is the ultra-light Whisperer 7Dx10D ripstop nylon fabric. The tightly netted but soft and ultra-light fabric is made by the laborious process. The lining fabric makes the jacket perfectly down proof to prevent clusters from escaping through tiny gaps. Thus, the jacket is completely breathable, windproof and down insulated. The type of insulation in the jacket is 800-fill Q. Shield down which will keep you warm and toasty throughout. The insulation also is water resistant. The shield resists the heat-robbing moisture and retains maximum loft even when wet. The low profile quilt pattern creates heat-trapping down the channels for extra warmth. Thus, the lightweight warmth makes the jacket incredible for layering. There is an adjustable and insulated hood in them for more warmth. Also, the single interior toggle hem is available on the fly for easy adjustment. The single hem cinch cord will seal out the cold on the blustery weather. Their cuffs are buttery soft with elastic binding to seal the moisture and cold. The built-in carabiner loop lets you attach stuffed jacket pocket to harness. All the pockets are zippered hand warmers. The pockets are spacious as a stuff sack. Also, the stuff sack allows to quickly fold the jacket into a small hand pocket. Columbia Women’s Platinum 860 TurboDown Hooded Jacket are the down jacket for the active winter adventure. Outfitted with enhanced performance, the jacket is ultimate light and well packable. This best buy product has the weight of 16 ounces. The main shell is 100% nylon with 30D Micro Ripstop. The rich water resistant shell also has good breathability providing proper warmth and insulation. Whereas, the lining is 100% polyester with Omni-Heat Reflective Microtex. The Omni-Heat Reflective Technology is a unique, proprietary, multi-denier fiber made from 50% recycled material. The technology boosts heat retention by 20% while drawing excess heat away during high exertion periods. The jacket is the combination of 60g synthetic insulation and 800-fill goose down. This combination gives 860 TurboDown of ultimate heat retention and insulation, even when wet. The Omni-Heat Thermal Insulation is the unique feature of the jacket. Little silver dots cover the inside layer of the garment to reflect and retain the warmth of the body. An adjustable hood is attached at the top. There are interior as well as exterior pockets secured by zippers. The active fit of the jacket is maintained by the adjustable drawcord hem. Attachment of the drop tail at the end is another good feature. You are not exposed to other elements while sitting or crouching. The central back length measures 26” reaching up to the hips. Columbia Women’s Platinum 860 TurboDown Hooded Jacket are one of the best down jackets with proper comfort and fit providing the ultimate warmth and insulation. Arcteryx Cerium LT Women’s Hoody is the lightest down jacket in the Cerium series but is the warmest for cloudy and chilly days. Made with ultra-premium materials and down composite mapping, the down jacket will provide efficient warmth and protection. This down jacket has feather weight of just 9 ounces. The core fabric of the jacket is nylon with down insulation and coreloft polyester fibers. The fabric is made with high tenacity. They are tightly constructed fabric with good durability and smoothness. The insulation is supported with 850-fill-power European goose down in the core and sleeves. The down insulation is extremely compressible and can deliver superior warmth for its weight. The durable and light face fabric is laminated with a durable water repellent (DWR) finish to repel moisture and ensures complete dryness and comfort. This layer contains polyester which can hold light precipitation too. The synthetic coreloft is a special fabrication in the jacket to insulate even when damp. This targets the underarms, hem, and collar where moisture mostly build up. There is a low profile down insulated Storm Hood with hood adjuster. Unlike other type of hoods, they are firmly attached from all the side giving high protection. Low-profile elasticized cuffs and hem will manage the relaxed fit. The zippered hand pockets will store your emergency stuff. Though the jacket has multiple layers, they can be packed down easily. The inclusive stuff sack has made this possible. All of these are designed in a stylish way. Arc’teryx Cerium LT Hoody is an imported branded down jacket which can even be used for mountaineering. This light material will keep you optimum warm in any kind of cold during outdoor adventure without any bulk or weight. Down insulated and superlight, the Rab Microlight Alpine Women’s Jacket is ideal belay jacket perfect for highlands, mountain climbing, backcountry skiing, ice climbing, and other outdoors or just as a daily winter wear. They are lightweight and durable garment weighing 14 ounces. Though they weigh less, they keep warm and cozy like never before. The material of the jacket is 100% nylon ripstop with Pertex Microlight face fabric. The Pertex Microlight face fabric is extremely strong yet soft, water resistant and properly breathable. Moreover, Pertex Microlight shell features DWR finish to keep light rains and snow off. The insulation type is hydrophobic 750-fill-power European Nikwax goose down. This down type is treated to stay drier for longer time. This also evaporates sweat faster than non-treated down. The down is extremely lightweight, warm, and compressible. The design is enhanced with mini stitch through baffle construction that keeps you down evenly spaced. This strengthens the breathability of the material keeping you dry and warm. The down filled hood has a wired brim along with front zippers with internal down filled baffle. There is also a chin guard to protect your skin. Further, they feature zippered hand pockets, elastic bound cuffs, and an adjustable hem. There is an adjustable hood with flexible polymer wired peak. This will give you extra warmth and protection. The separate stuff sack will provide space for your emergency stuff. Also, the sack can pack easily stuff jacket for comfortable packability. This jacket is a Rab fluorocarbon free hydrophobic down. Thus, it is an environment friendly product. Rab Microlight Alpine Women’s Jacket has a slim fit which will give you a stylish look. Rab Microlight Alpine Women’s Jacket is undoubtedly a product with high quality and unbeatable features. Hydrophobic 750-Fill-Power European Nikwax Goose Down. Built with versatile construction, Patagonia Down Sweater is a synthetic down insulated jacket with decent lightweight and compressibility. They weigh 12.2 ounces only. They can be unquestionably taken to ice climbing, winter skiing, and other cold season treks/hikes. The shell fabric is 20x30D 100% recycled ripstop polyester. They are tough, resistant to stretching & shrinking, chemicals, crisps and resilient wet or dry. The texture is wrinkle as well as abrasion resistant. The construction is bolstered with DWR treatment backed with 22D recycled polyester. DWR finish repels snow and rain off the jacket’s surface without interfering breathability. The down of the jacket is 100% traceable with 800-fill power with quilted-through construction. Traceable down are the third party verified non-live-plucked and non-force fed feathers. Thus, they don’t go against animal welfare too. The jacket assures lofted warmth. They come with updated design for more contoured fit. That includes new quilting lines and a slightly longer hem. Plus, the front zipper has wicking interior storm flap and zipper garage at the chin for next to skin comfort. The hood reaches up to hip length for extra protection. The elastic cuffs are bounded with nylon for sealing the warmth comfortably. The drawcord hem tightens from inside the handwarmer pockets. Patagonia Down Sweater are the super light, extra warming outerwear with easy adjustment. Plus, you get classic styling and a lot of color options. Arc’teryx Thorium AR Hoody is a lightweight mid-layer offering warmth and versatility along with substantial durability. This hoody weighs only 12.9 oz offering minimum bulk but maximum protection and warmness. So, they are perfect for multisport, climbing, backcountry skiing and even as winter wears. The shell is fabricated with soft and durable 40D nylon with Durable Water Repellent (DWR) finish. The core nylon fabric is smooth to your skin, but the polyamide chemical in it are exceptionally strong. They are wind protective, abrasion resistant, and even resistant to damage from oil and many chemicals. They resist water and gets dried quickly. The insulation in this down jacket is full of 750-fill- power European goose focusing in the core and sleeves parts where the warmth is needed more. The insulation also works on even in damp situations. Thanks to Coreloft Insulation! It is the insulation made with highly crimped multi-denier siliconized polyester yarn. Their polyester staple fiber is breathable, compressible, thermally efficient and has excellent loft retention. They are placed in the underarms, hem, and collar where moisture may build up. Thus, the hoodie keeps you locked from every moisture attack. The hip-length hoodie has a low-profile design supported with Coreloft insulated Storm Hood. The elasticized & adjustable, cuffs and hem are also constructed with low profile structure. There are two zippered hand pockets where you can put handy but emergency stuff. They are easy to wash and mildew resistant. The jacket is such portable that it can even be packed into its stuff sack. And undoubtedly they have a relaxed fit for every size. The women’s lightweight Thorium AR Hoody strategically combines all the good features with synthetic insulation. It will deal/resist the unnecessary moisture, perspires properly and keeps you warm in every type of weather. Sleek and stylish in nature, the North Face Aconcagua Women’s Jacket is warm and versatile down filled jacket for hiking/trekking in chilly winter days. They are lightweight material weighing 20 ounces. They are sufficiently compressible and well packable. Made with nylon core shell, they are more durable, weather resistant, flame retardant and tough. Also, the lightness of the fabric also supports quick drying and have increased breathability. The heat seeker polyester at the side panel also supports in moisture wicking. The long lasting warmness of the jacket is supported with 550-fill goose down insulation. They even comfort you without weighing you down. The downproof and wind resistant has a special stand-up collar with velvety soft lining for added cushioning. They are advanced with active fit along with snap-in compatible with selected shells. The design is also exceptionally made with a slightly shiny satin nylon exterior and diamonds shaped baffles. The jacket is strengthened with wind flaps behind zippers for protecting against air penetration and zipper snags. Secured with zipped handwarmer pockets, their drawcord hem and elastic cuffs are also insulated. Thus, they too seal out cold drafts and retains warmth. Women’s The North Face Aconcagua Jacket are the downs perfectly built for adventure loving enthusiasts. If you are looking for a multi-functional down jacket at an extremely reasonable price, Outdoor Research Aria Women’s Jacket is the one for you. The imported garment is lightweight, breathable and water resistant with competent insulation and warmth. They have lightweight of 12.1 ounces only. They are fabricated with 100% ultralight recycled ripstop polyester of 20 denier at the shell section. The lining is also sustained with pure processed polyester of high quality. Polyester is the synthetic fabric with more resistivity for water, chemicals, flame, abrasion, etc. also, they are lightweight, smooth and quick drying. For the insulation, the jacket has 650-fill power goose down insulation. They are assembled with swirled quilting that keeps the down in their firm position. The down, along with shell and lining fabric will provide layered warmth for the stinging cold. There is a stuff sack in it which packs the whole jacket into its least structure. It will pack the jacket easily within less area at any time. The single-pull hood nested in the jacket is easy to use and operate. This enhances for the relaxed adjustment. Furthermore, there are dual hem drawcord and elastic cuffs for sealing in warmth. Also, there are zippered handwarmer pockets and internal security pockets featuring headphone cord port. Outdoor Research Aria Women’s Jacket is the compressible, soft, warm, and beautiful down with pretty quilting pattern. This jacket is definitely worth buying. Arc’teryx Cerium SL Women’s Jacket is a well-constructed, super lightweight and compressible insulated sheath weighing 5.8 ounces only. They are backcountry technical jacket with the great characteristic warmth-to-weight ratio. They are fabricated with wind and moisture resistant, Thisela as outer face fabric. Thisela is very stable and incredibly lightweight 7D ripstop taffeta offering excellent ruggedness. The face fabric is updated super lightweight and has a durable water repellent (DWR) finish. The down is premium 850-fill-power European goose down lining the core and arms where warmth is needed most. There is Coreloft embedded in moisture-prone areas like collar, cuffs, underarms, and shoulders for insulating dampness. Coreloft is a synthetic non-woven insulation. It is durable, resilient, and light that dries quickly and retains warmth when wet. Moreover, they are breathable, thermally efficient and has excellent loft retention. The jacket has easy, tall and warm collar layers. It features full front zip with chin guard. They have low profile design with elasticized cuffs. They have sealed and elasticized rear hem for convenient adjustment. They have a stuff sack for easy packability. Arc’teryx Cerium SL Jacket is beautifully designed downs with synthetic insulation including persistent performance. They are ideal jacket for climbing, hiking, trekking, travel, and commuting. Completely dedicated to outdoor adventures, the North Face Nuptse 2 Women’s Jacket is the imported warm and comfortable jacket. They are comparatively weighty than other downs measuring 25.04 ounces. The shell fabric is 100% polyester. Polyester is extremely strong and durable fabric resistant to most chemicals, stretching and shrinking, wrinkle resistant, mildew and abrasion resistant. So, the shell is highly protective and long lasting. The lining of the coat is also with polyester. This section includes the ultralight recycled doubled layered taffeta. The moisture wicking capacity of polyester is well known. This works wonderfully for sheathing and resistivity. They are insulated with high loft 700-fill power goose down insulation. This patterned down delivers plush warmth even in the harshest cold. Also, there is standard brushed collar lining for additional warmth and wind protection. The North Face Nuptse 2 Women’s Jacket is crafted with at least 90% bluesign approved fabric, a standard for environmentally responsible production. The jacket features a streamlined silhouette. This enhances the relaxed fit for optimal comfort. Additionally, there is full-zip front closure with interior wind flap. The zippered hand pockets and adjustable drawcord hem are also present. The hook and loop cuffs help in keeping out the cold. The North Face Nuptse 2 Women’s Jacket is the down classically redesigned with the sleek and complementary fit. Down Fill Power is a measure of the loft or fluffiness of the down and its insulating properties. The higher the fill power, more the insulating jacket will be for its weight. The insulation of the jacket is only because of this. Fill power in the down jacket ranges from 400 to 900. It also makes the jacket more compressible and lighter. The primary reason to choose down jacket is the interminable warmth and comfort, they provide. Obviously, it is not possible to wear layers and layers during the long day’s treks. So, it is necessary to find a garment performing wide range functions. That choice is down jacket. They are a fantastic insulator with the soft and warm under feathers from duck or geese. The down creates thousands of tiny air pockets that trap air and retain heat. Thus, they comfortably keep you warm. The featherweight property is the significant pros of the down jacket. All the down jackets weigh less than a pound. It makes easy for you to carry and wear. Also, due to the stuff sacks, they can be packed within their pocket. So, it even gets packed in small space and is well packable. In spite of lightweightness, they have better warmth to weight ratio. Down Jacket is a jacket with excellent heat retention. As I have already said, they create thousands of tiny air pockets for trapping air. That air pockets help to respire and keep sweat out. The thin, light outer shell also supports this function. The waterproofness can be another importance of down jackets. As we know that, almost all the down jackets are water resistant and among them only some are waterproof. Their shell is often coated by a Durable Water Repellency (DWR). This will help to keep moisture out without affecting breathability. Thus, they are protective in many ways. They have wide comfort temperature range which makes them suitable for cold and warm temperatures. The down jacket is great for wearing in all the kind of outdoor activities including mountaineering. They can bear a wide range of temperature and weather conditions. Also, they can be worn regularly at present or on cold days for many years to come. Thus, it is worth to have down jacket especially with the slightly heavy weight and thicker outer shell. In my view, down fill power is the first thing in down jacket you should check for. Down Fill power is a measure of the loft of the down and its insulating properties. The higher the fill power, the higher is the insulation and heat retention of the jacket. It also indicates the quality of the down used. The higher quality down jacket features insulation and warmth. Also, they are more compressible and lighter. Fill power of the down ranges from 600 to 800. The fill power of 400-450 is medium, 500-550 is good, 550-750 is very good and 750-900 is excellent. The key component of your jacket determines how well it retains warmth and handles wet conditions, as well as how small it will pack. The insulation is also affected by shell materials. Shell materials affect rain protection, breathability, mobility, durability and jacket’s windproofness. The weight and compressibility are even important for any activity where you will be carrying them. All these insulation choices also depend on the type of your destination. The materials used to insulate a jacket, shell materials, and linings are also to be considered before buying a down jacket. The shell and lining of the jacket affect on its durability, weight, warmth and water resistant. The most two commonly used materials are nylon and polyester. They both are durable and can withstand harsh conditions better. Also, the jacket with an extra layer lamination fabric is better as this increases the water resistivity and heat retention property. Down Jackets are constructed in a number of different designs, which has smaller baffles or compartments, and many layers. You should even pay attention to the type of stitching. As we are talking about women’s down jacket, they have different construction than men’s jacket. Find the difference and attempt to purchase the appropriate one. About the fit, the good jacket typically fits in the sleeves and torso and is right cut for your shape. Hoods, adjustments, vents, hems, pockets, and special features like powder skirts all affect comfort and convenience. You can check these different extra prerequisites in your down jacket before buying. Well, all of the products have their own features and uniqueness. All of them are equally helpful for all hiking conditions. But if I have to choose I will go with Mountain Hardwear Hooded Ghost Whisperer along with Mountain Hardwear Hooded Ghost Whisperer. Both of them are incredibly light, compact, well packable, and excessively warm. Also, their type of insulation is totally excellent. Filled with 800 Q. Shield down, Mountain Hardwear Hooded Ghost Whisperer has softest ultra-fine fabric of superior quality. Low profile quilt pattern enhances its styling along with the performance. Similarly, the jacket is completely water resistant, breathable, windproof and will keep you warm at full length. Talking about Arcteryx Cerium LT Women’s Hoody, they are inbuilt with special synthetic coreloft insulation. The durable and light fabrication of the jacket along with DWR Finish will give you all round protection and cushioning. 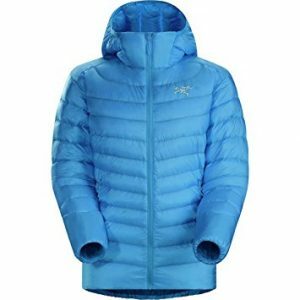 These were the stuff I had for today on 10 Best Down Jacket for Women. I am sure you will try and love all the mentioned products. Till then keep loving us and keep tracing adventures in life! And yes, don’t forget to share your opinion below in the comment box.